Open to anyone interested in playing with a string orchestra, the Chamber Orchestra of Laredo (C.O.O.L.) brings together students from the University and area high schools to perform mostly string orchestra music of the highest repertoire. C.O.O.L. performs at least one full concert every semester. Repertoire is highly focused on developing the overall ensemble skills of the members. Applying chamber music techniques such as those used by the Orpheus Chamber Orchestra each individual musician in the orchestra plays a leading role in the overall musical development of the orchestra. Is the Chamber Orchestra the same as the Laredo Phil? No. The Laredo Phil is a fully professional symphony orchestra where all members are auditioned and compensated. Some, highly talented and dedicated members of the Chamber Orchestra are invited to perform with the Laredo Phil. Non music majors can enroll in the Chamber Orchestra for credit using the general electives within their degree plan. Will Financial Aid cover Orchestra? Yes – if you use orchestra as the General Elective within your degree. 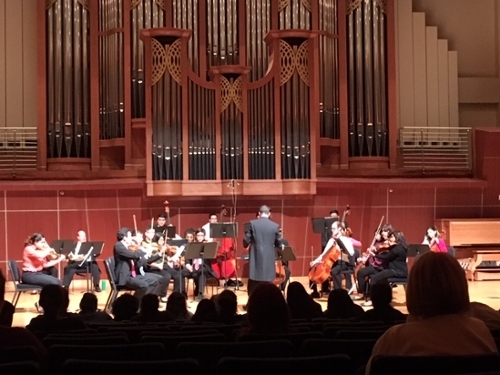 For music majors, orchestra is the required ensemble for all string students and is covered within your degree plan. Some limited scholarship money is available for non-majors. Students must apply for the Fine Arts Scholarship and submit form to Mr. Brendan Townsend (btownsend@tamiu.edu). Recommendation for scholarships will be based on merit, dedication, and extra curricular involvement beyond the rehearsal time. Everyone is welcome to enroll in Orchestra, however, placement will be based on a seating audition held during the first week of classes in the semester. Do I need to own my own instrument? It is best if you bring your own instrument, however, the Dept. of Fine & Performing Arts does have a limited supply of instruments which students can sign out to play with the orchestra.